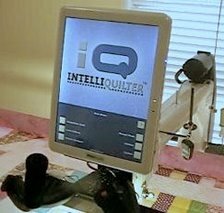 IntelliQuilter Training Videos: How to set up and stitch a panto on a large, non-rectangular quilt. How to set up and stitch a panto on a large, non-rectangular quilt. Thanks to Connie for making this very clear video showing how to set up and stitch a panto on a non-rectangular shaped quilt. This was video made in response to a question asking how to stitch a large octagon shaped table runner.